From the outside, Dinah Laurel Lance's life was … normal. Almost boring, in some respects. Her father, Larry Lance, was a respected police officer turned private investigator and her mother, Dinah Drake Lance, was a florist. They were well off, though not exceptionally rich, and she never lacked for anything. She was their only child and was doted on, but not overly so, and was one of the lucky ones that wasn't totally spoiled by her parents. Her mother owned Sherwood Florist, a small shop located in Gotham. It also housed her father's business and their modest apartment. Much of Dinah Laurel's early childhood was spent in the flower shop, learning about the plants and how to arrange them. If she wasn't doing that, she was spending time with her father, learning bits and pieces of his line of work. The truth, as they say, is stranger than fiction, and it should come as no surprise to most that her seemingly idyllic home life was far from 'normal'. Her mother was more than just the local florist; she was also the fishnet-wearing street vigilante known as Black Canary. Thievery skills coupled with a martial arts prowess that was nigh unmatched, the Canary was a formidable guardian of Gotham. The key word being 'was', in that Dinah Drake hadn't touched her fishnets in twenty some-odd years … but the stories of her exploits would be the younger Dinah's bedtime tales. The adventures of Black Canary and so many other heroes would serve as both a point of wonderment and inspiration for the young girl. It's no wonder, then, that Dinah Laurel wanted to follow in her mother's footsteps. The precocious girl took it upon herself to learn martial arts and boxing, stealth and the thievery skills of her mother. At first, Dinah Drake indulged her daughter and helped her, using the pretense of teaching her self-defense in order to protect herself. But as she gained in years and her daughter proved to be almost as skilled as herself, she came to realize that Dinah Laurel had an ulterior motive. 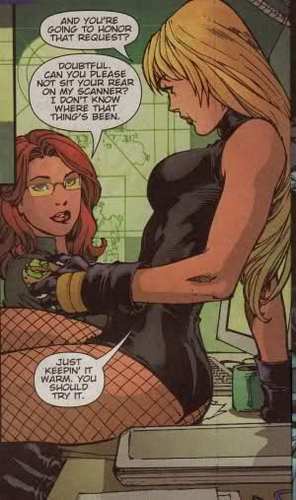 The younger Dinah wasn't content to just learn enough to defend herself; she wanted to be the next Canary. She wanted to be just like her mother, wanted to make her /proud/ … and found those hopes shattered when her mother stated in no uncertain terms that she wouldn't let it happen, not if she could help it. "The world's too dangerous now," she said, "It's not as safe as it used to be." In fact, those same reasons were another large part of why Dinah Drake had retired her fishnets long before her daughter's birth; she just wanted to settle down and try to have a 'normal' life. When Dinah turned thirteen, her metahuman power emerged rather violently and destroyed every pane of glass in the shop. Her sonic-based attack was difficult to control, no matter how she tried, so she focused on her martial skills instead. Ohly after 2010 was she able to refine the control over her voice through rigorous training. Even without control she tried to use it as a bargaining chip against her mother, but to no avail; even with (and, especially /because/ of) such a potent ability at her disposal, her mother once again disapproved of her daughter's desires. Years passed. Dinah continued training in secret with the same people who trained her mother, with people she'd come to acknowlege as aunts and uncles … even sneaking out at night from time to time in an improvised costume (complete with wig) to try and fight crime. Most of the time, she'd come home empty-handed and exhausted — a whole lot of running around for nothing — and sometimes she'd have the satisfaction of knowing she took a drug-dealer off the street. She took care to make her actions as secretive as possible … but that didn't mean they went entirely unnoticed. Her father was not ignorant but, rather, turned a blind eye to his daughter's nightly excursions and felt that, perhaps, it was just a rebellious phase in her that would fade in time, after her first big injury. He should have figured that if it didn't stop the mother, it certainly wouldn't stop the daughter. All the same, Dinah Laurel was forced to take a reprieve after her first botched attempt to stop a robbery on her own resulted in a broken arm and several broken ribs. When she turned 18, she went to college and quickly became smitten with a young man named Craig Windrow. Theirs was a whirlwind affair, from dating to engagement to married in a matter of months … and then divorced less than a year later. She dropped out of college and returned home, much to the relief of her mother, and settled into life as a florist. She did not, however, stop her training. That was the single constant thing in Dinah's life, something that would intensify after her failed attempt at both marriage and college. It became more and more apparent that she was still not the woman her mother was and that grated on her in a way she never imagined it would. Her return home coincided with her parents' joint decision to go on a lengthy vacation, the details of which they opted not to divulge. She didn't ask why or where they were going; her mother was stubborn enough not to tell and the younger Dinah stubborn enough to try to do things on her own without her mother there as a safety net. … and, to be fair, there was a greedy spark of joy at her mother's leaving: it would finally give her the chance she needed to step up and try to overcome her mother's shadow. 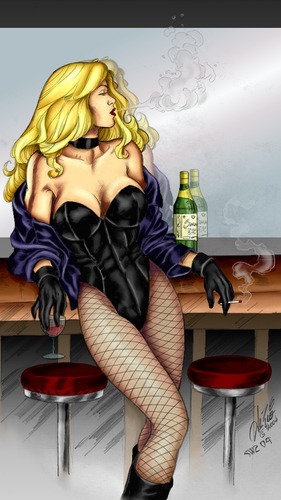 Thus, at the age of 19, did she take up the mantle of the Black Canary. She continued to push herself in her training. Without her mother around, she could do so with more focus than ever before. Her training reached a peak when she was invited to train under Sensei Otomo in China; she cobbled money together and left the shop in the capable hands of her mother's former assistants. In China, she trained rigorously for two years and was affectionately nicknamed 'siu jerk jai' — 'little bird' — by her sensei. She was like a daughter to him and one of his most prized pupils, a relationship which was problematic in that her sensei would never push her to her utmost in ability. He'd always pull back, where with other students he would not, so as to avoid truly hurting her. So she, realizing she would never achieve her full potential with him (and to spare him, in some respects) Dinah bid him farewell and returned home. Several years have since passed without word from her mother … and in the meantime, Dinah Laurel maintains both the shop and the reputation of the Canary, though not without difficulty. Everything still hangs in a tense balance … and where she still, deep down, fears the return of her mother to take her role back. While she has her share of flaws, Dinah's real strength is in how she embodies the essence of the hero when she puts on the leather and fishnets. She is confident in her abilities, knowing exactly what she can do, and is brave enough to risk doing them for the right reasons. Once taking on a case, Dinah is as persistent as a bloodhound and doesn't stop until things are resolved to her satisfaction. Perhaps it's her competitive nature. She doesn't like to lose. Ever. At anything. The woman will do anything for those she cares about, and doesn't hesitate to put herself in danger to save another. 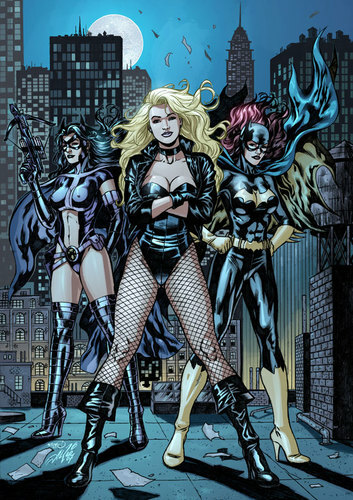 Anyone who fights crime wearing fishnets and leather has to have a flair for the dramatic, as well as perhaps the audacious. She's not afraid to attract attention, dress flashy to the point of being brazen, or steer her car towards another to get someone to stop. And she does it all with style and attitude. Dinah isn't afraid to speak her mind, and often does so without thinking about what she's saying or whose feelings she might hurt. Yet for all her confidence and control, Dinah has her moody side. It's a hair-trigger response that can be triggered by seemingly minor and silly things, but once it goes off that's when Dinah goes off as well. At that point, she's quick to jump to conclusions, whether or not there are supporting facts that matter. Dinah has a metahuman gene that enables her to project her voice in what has become her signature 'Canary Cry'. She has control over the intensity and aim of her 'cry', being able to do anything from stun a human opponent to inflict serious damage on brick or steel structures. Regardless of the intensity, the sound is deafening to anyone in its path, and can be quite debilitating. It doesn't come without a price, however. The Cry is draining, and Dinah is prone to 'losing her voice' at the most inopportune times. It's based upon any injury she may have received to her throat, how often she uses it, her general level of physical health, and a bunch of other factors that really prevent her from becoming completely dependent upon it. Another effect of Dinah's meta-human gene is an immunity to the Canary Cry's effects. Sirens, shrill noises, and sonic grenades also have no effect whatsoever on her. Only a sonic effect something with sufficient concussive force would affect her. This immunity allows her to scream her fool head off to disable her foes without being hampered by it herself. Dinah owns a florist shop in Gotham City. It's not big, but it's just the right size for someone to run with an assistant or two. And it's relatively profitable, ensuring that she has a steady income. Due to her training, Dinah's reflexes are at the top end of the human scale. It's enough to give her an edge in a fight. With room to move, she can either block or catch an arrow that's fired at her. Dinah's motorcycle is custom Triumph, loosely based on the classic Bonneville design. She built it herself and has rebuilt it by hand as well. An open design without a cowl, the gray and black bike is set for night riding. Dinah has tuned it for cruising, although it's easily capable of speeds in excess of 120 mph. Dinah grew up surrounded by 'aunts' and 'uncles' who were part of her mom's hero community. While many are retired or otherwise inactive, Dinah can turn to them for help in a pinch. Dinah's learned how to leap, tumble, vault, and flip from some of the best in the business. She couldn't make a living on a trapeze, but she's good enough to make effective use of these skills in combat. And she's wonderful at parkour. Dinah learned how to ride a motorcycle at a very young age from one or two of her adopted 'aunts' and 'uncles'. She's better now than most motor cross racers, capable of dodging between moving cars, screaming down narrow streets, and maneuvering in and out of obstacles at racing speed with remarkable finesse. She's not bad with cars, either, though given her preference she'll always take two wheels over four. Dinah was raised in a flower shop. She knows how to do everything from simple arrangements to planning a wedding or funeral. In addition to knowing which flowers are most appropriate and most hearty for the occasion, Dinah knows where to get them and how much is a reasonable price to pay. She knows how to run a shop, including balancing the books and keeping her stock fresh. Dinah's learned the basics of investigation from listening to her father (a private detective) and, of course, her mother (the original Black Canary). Since her start in the hero business, however, she's honed her skills even further. While Dinah has a lot to learn, she knows how to conduct a police investigation, how to approach a crime scene, and how to ask the right questions. Dinah is a master at Judo, having studied with Sensei Otomo in China. A hard style of holds, strikes, and throws designed to bring opponents down quickly, the style suits her personality and she's developed a natural affinity for it. One bends without breaking; yields to win. Since then, she also learned bits and techniques from a variety of other forms in combat, including Kempo, Aikido, and Tae Kwon Do and continues to seek knowledge. She trains daily. In combat, she uses everything she knows, regardless of the source or style. While she prefers weaponless combat, Dinah is also skilled with traditional martial arts weaponry. Dinah is capable of fixing most anything on a bike. Learning primarily out as a skill of necessity, Dinah now works on her own bikes as a matter of pride. In addition to making proper repairs, she can also jury-rig something so she can get going in a hurry. So much of Dinah's crimefighting work involves being discrete in places where it would be very unhealthy to be compromised. She's learned how to move silently and avoid drawing attention to herself. While she doesn't have the same level of skill as a ninja, Dinah can usually get in and out of someplace without getting caught. She's also taken to concealing various lock picks in her costume, and she's become rather good at picking anything with a keyhole and internal tumblers. A girl never knows when she could find herself in need of opening a locked door or a pair of handcuffs without a key. It's really all about looking for the obvious little things. Things out of place, such as broken twigs on a bush or droplets of blood that people may not realize they left behind. Things that a good detective, or a skilled hero, notices. Dinah learned what she could from her adopted 'aunts' and 'uncles' in the hero community, and while she's not up to their skill, she has gotten to be pretty good. Dinah Lance has been the Black Canary for some time now, first as mother and then daughter. She has an unlisted phone and address, but anyone who pay attention to details can match up Dinah to her heroine moniker. While she tries to be careful to protect her identity, she isn't perfect. Sometimes being strong in your focus isn't a very good thing. While Dinah's tenacity can be considered an asset, she is also too stubborn to ask for help, even when she really needs it. And she's too willing to get into dangerous situations, in spite of well-intentioned warnings. To put is simply, Dinah's afraid of technology. Oh, she may be a wiz of a bike mechanic, but anything more complicated than a pocket calculator scares her to death. And don't even ask about programming her VCR.